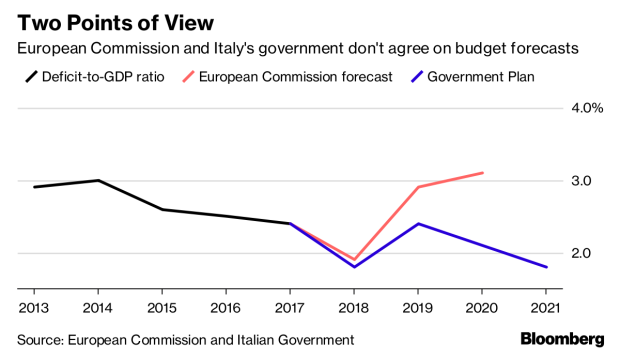 (Bloomberg) -- Italy signaled it would not bow to pressure from the European Union to water down its budget for next year, with Deputy Prime Minister Luigi Di Maio dismissing the prospect of sanctions as unlikely. Speaking to the Foreign Press Association in Rome, Di Maio of the anti-establishment Five Star Movement said he was open to dialogue but made no hint of concessions. The populist government is preparing to reply to the European Commission by next Tuesday’s deadline. “We have made commitments and we will stick to these commitments to be a credible country,” said Di Maio, adding that a citizen’s income for the poor and a lower retirement age would not be delayed. After skepticism from Brussels, he said the government is confident about a 2.4 percent deficit target for next year because of a pickup in economic growth and cuts to wasteful spending. Separately, Finance Minister Giovanni Tria told a parliamentary hearing that the government isn’t planning to change the deficit target, and will reaffirm to the EU the key points of its budget plan. He said the EU projection of a 2.9 percent deficit next year is not justified. The government is locked in a clash with the commission on its budget plans, accusing Brussels of botched analysis over economic forecasts. At the same time a push to deliver on at least part of election promises is sparking near-constant wrangling between Di Maio and fellow-Deputy Premier Matteo Salvini of the anti-migrant League. Di Maio said an EU fine on Italy for an excessive deficit was not in the cards, adding that other countries had breached budget rules in the past “and no one said anything.” He insisted that the budget aims to lower public debt with expansionary measures. “We sincerely want to explain that 2.4 percent is the maximum,” he said. Taunting European commissioners who have lambasted Italy’s budget plans, Di Maio said European Parliament elections due in May would likely bring an “unexpected” result and change the make-up of both the Parliament and the Commission. But he said that result -- populist parties are campaigning against what they say are Brussels bureaucrats and the European elite -- will not mean the EU is finished. Di Maio reiterated Italy should stay in the eurozone. “We must not leave the euro, I speak also for the government,” he said.